How to STOP and TURN your Paddle Board. An easy and efficient way to stop the momentum of your paddle board and turn the nose towards the opposite direction you must “Back Paddle”. By following these Key Points, you will be able to conduct a Back Paddle efficiently while feeling balanced and confident. Move the paddle towards the side of the board in which you want to turn your nose. Place the blade into the water behind you right next to the rail. Then submerge the entire blade into the water until it is not visible. While keeping your knees slightly bent, tighten your core and grasp the t-handle and shaft tightly. Drag the blade in the water from the tail towards the nose of your board. Make sure you are keeping the paddle close to the side of the rail. Conduct a Back Paddle 2-3 times on one side. This depends on current and wind of how many times you need to stroke. Once your board is almost turned 180 degrees, switch the paddle to the other side. Then stroke from the nose to the tail right next to the rail of the board. Learning how to Back Paddle is necessary. If a boat comes in front of you or the wind pushes you towards rocks, you want to know how to turn your board away. That way you do not run into anything that could harm you or your SUP. 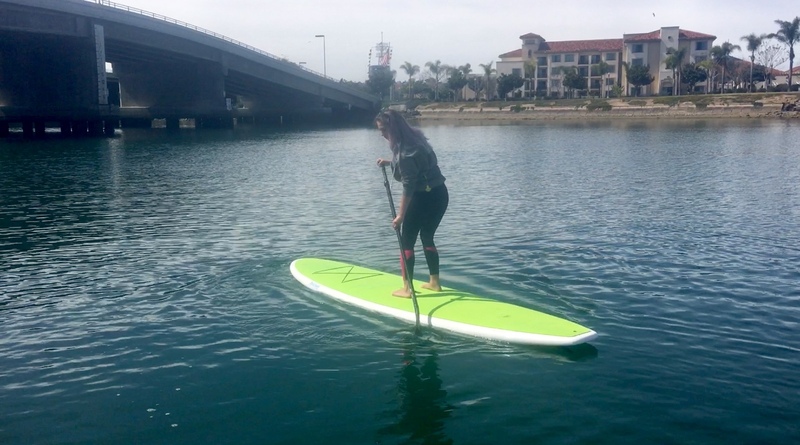 You want to feel confident on your paddle board. Once you understand how to maneuver your board, you will be able to transition into paddling in different types of water. You want to eventually become one with your board.